CEO Hiroto Saikawa is very much in charge of steering Nissan through the deepening crisis. TOKYO -- Nissan Motor Co.’s directors failed to name a successor for Carlos Ghosn amid a widening rift with partner Renault SA on governance issues that prompted Japanese prosecutors to jail the iconic executive and also indict the carmaker. 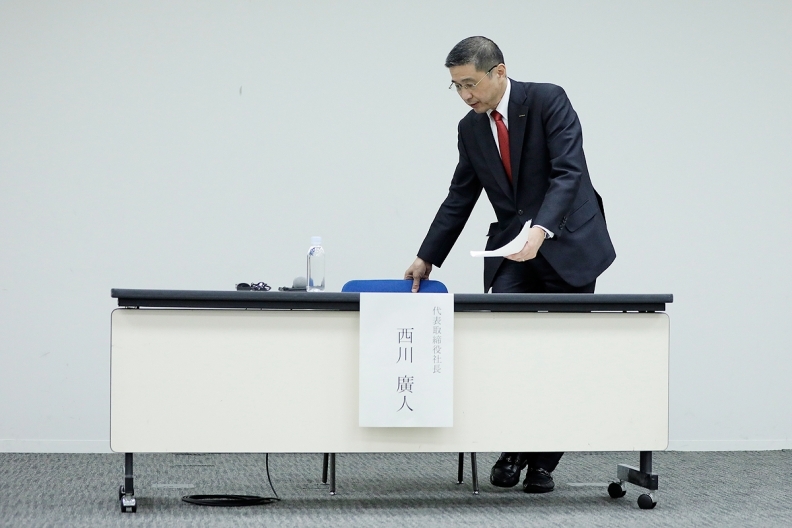 The board instead chose to appoint a new committee to improve corporate governance, CEO Hiroto Saikawa told reporters Monday after a meeting of the directors. The committee will give its recommendations by March 2019, almost four months after the Nov. 19 jailing of Ghosn and his hasty ouster as Nissan’s chairman three days later. The board may wait until the committee’s comments before naming a chairman, Saikawa said. The decision to wait further comes as Renault, Nissan’s largest shareholder and the company that bailed out the Japanese automaker two decades back, sent a letter demanding a meeting of all shareholders to discuss Nissan’s difficulties. Ghosn’s arrest has escalated tensions between the companies, whose car alliance -- the world’s largest -- has been held together by Ghosn throughout its existence. Ghosn, 64, was arrested in Tokyo for alleged understatement of his income, and on Dec. 10 he and the company were indicted by Japanese prosecutors over the suspected misconduct. The company’s indictment has expanded the scrutiny beyond Ghosn and raised questions about Nissan’s corporate governance. It has also cast attention on the leadership of Saikawa -- so much so that his job may even be on the line, according to analysts and people familiar with the situation inside the company. Saikawa’s apparent caution at Monday’s press conference was in stark contrast to that of Nov. 19 in which he attacked Ghosn for having too much power and questioned how one executive alone could take the credit for the turnaround of Nissan. None of those attacks were there on Monday when Saikawa was a lot more matter-of-fact and ended the press conference in about 30 minutes. While Nissan ousted Ghosn, Renault technically kept him on as chairman and CEO while it seeks more information and evidence about the accusations. In a sign of a deepening divide between the partners, Renault is pushing Nissan to call a shareholder meeting as soon as possible to discuss the Japanese automaker’s indictment, governance and the French company’s appointees on Nissan’s board, people familiar with the matter have said. Still, Saikawa and other Japanese executives within Nissan have spoken strongly against a merger. A Nissan lifer who was elevated to CEO when Ghosn stepped back from the role last year, Saikawa has a reputation as a fierce defender of Nissan’s interests within its dealings with Renault. Renault appeared to have been blindsided by Ghosn’s arrest and the allegations that have drifted out. Its executives are suspicious of Nissan’s motives, demanding to see proof from the Japanese carmaker of the accusations against Ghosn, people familiar with the matter have said.